When it comes to skincare, there are a few things that everyone, regardless of skin condition, needs to do: cleanse, exfoliate, and moisturize. When it comes to hydrating your skin, nothing does that (and a few other things!) better than hyaluronic acid. This miraculous fluid is not only indicated for dehydrated, aging, or post treatment skin, it is equally great for oily/acneic skin as well. So how does hyaluronic acid do it all?Hyaluronic acid is a fluid that is already present in the human body. It’s found in skin tissue and lubricates our joints. It can hold up to 1000 times its weight in water, effectively binds water to cells, and is responsible for the elasticity and resiliency of the skin. This makes for a super hydration conductor that naturally affects our skin at the cellular level, without oils. Additionally, it works wonders on wounds and any type of irritated or post treatment skin, helping to promote the healing process.As we age, the hyaluronic acid in our body starts to deplete, so it’s a good idea to use a serum, like Ageless Total Pure Hyaluronic Filler on our skin on a daily basis. This unique solution is the perfect addition to any skincare routine. This super concentrated hyaluronic filler is infused with apricot essential oil plus Vitamin E, a potent antioxidant. Skin in transformed after just one application, leaving it totally hydrated. It is immediately plumped, moisturized, and smoothed, without the use of injections. 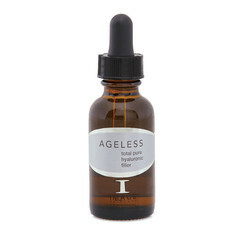 If you lack moisture, your skin is lax, dry, and/or aging, try adding Ageless Pure Hyaluronic Filler to any Image Skincare product to boost its efficacy. Or, for an especially powerful overnight treatment apply the filler followed by Total Retinol-A Crème, you’ll be glowing in the morning. If you have oily or acneic skin, use the serum on its own, for hydration without oil. Smooth a few drops on cleansed skin and let it absorb. You’ll get immediate benefits either way. For pure, honest hydration hyaluronic acid can’t be beat, no matter what your skin condition.